We want the young children we care for to grow into helpful kids, and kind and generous adults, and we know their parents do, too! As it turns out, helping behaviors can start at a very young age. Your daycare and preschool providers encourage these behaviors on a daily basis, and you can get your kids in the helping spirit at home, too! The journal Science published a study which suggests that children 18 months old and older can understand when their assistance is needed, and want to provide that assistance, even if there is no reward for their behavior. In a study in which adults dropped a clothespin on the floor, and did not indicate that they wanted a child to pick it up, nearly every child picked the clothespin up and offered it to the adult in question. So, how do your childcare providers encourage this helping instinct? First, they model good behavior to young children. Simply being on hand to help the kids locate a toy, use the bathroom, or calm themselves, models helping behavior. When kids see adults being helpful, they are more likely to return the favor. Adult caregivers can also respond positively to helping behaviors. When a child picks up an item, cleans up her play area, or shares a toy, praising that child will reinforce the positive behavior that they’ve just displayed. Childcare providers are often on the lookout for ways to point out situations in which children can help one another. If one child feels left out, or wants a certain toy, or is having trouble reaching something, a gentle suggestion to play with the lonely child, share a toy, or hand an object within reach, can show children how many opportunities they have to help. 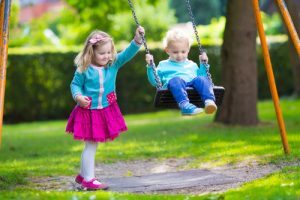 At home, parents can certainly employ any of these techniques, but they are also in a unique position to model helping behavior by choosing books, TV, and movies which show people helping one another and not hurting one another. Television such as Sesame Street and books like The Giving Tree can model generous behavior in a fun and engaging way. What books or television shows do you recommend for young children? Are there any in particular that you’ve found focus on helping behaviors?